Here are the predicted scores for Week 1 in Big Ten football. Back for his sophomore season, Hackenberg left some eye-popping stats from his freshman campaign for pundits to devour. He broke one Penn State overall passing record and 12 school freshman passing records, including the rookie marks for game and season passing completions, attempts, yards and touchdown passes. For the season, he was 231-of-392 for 2,955 yards, with 20 touchdowns and 10 interceptions. He had a long completion of 68 yards to Adam Breneman, good for a touchdown in the big win at No. 14 Wisconsin. Hackenberg also ran for four touchdowns and accumulated 2,887 yards of total offense, an average of 240.6 ypg. Hackenberg’s tremendous season was recognized nationally, as he garnered first-team True Freshman All-America accolades from 247Sports.com. He was selected a second-team Freshman All-American by Athlon Sports, Phil Steele’s College Football and CollegeFootballNews.com, with Heisman Trophy-winner Jameis Winston claiming the first-team nod. Hackenberg earned Big Ten Freshman-of-the-Week five times during the season, the second-highest total since the honor began in 2010. He also was named the Athlon Sports National Freshman-of-the-Week twice, following the wins over Michigan and at Wisconsin. Hackenberg finished third overall on the Penn State season passing yardage chart (2,955) and fourth on the season completions list (231). In 2013, Cook posted a 12-1 record as the starting quarterback and was named second-team All-Big Ten by the coaches along with honorable mention All-Big Ten selection by the media He also garnered All-Big Ten accolades from ESPN.com (second team) and Athlon Sports (second team) and was an Academic All-Big Ten selection. He completed 59 percent of his passes (223-of-380) for 2,755 yards, 22 touchdowns and six interceptions and ranked among MSU’s single-season leaders in touchdown passes (tied for second with 22), total offense (fourth with 2,831 yards), pass attempts (fourth with 380), passing yards (fifth with 2,755), pass completions (tied for sixth with 223) and passing yards per game (14th with 196.8 ypg.) In conference, Cook ranked among the Big Ten leaders in touchdown passes (tied for second with 22), pass completions (third with 223), passing yards (fourth with 2,755), passing (fifth with 196.8 ypg. ), total offense (sixth with 202.2 ypg.) and passing efficiency (eighth with 135.5 rating) and tied for the fewest interceptions (6) among starting Big Ten quarterbacks. Lunt is a sophomore from Rochester, Illinois that sat out the 2013 campaign after transferring from Oklahoma State. His 2012 season for the Cowboys say him make five starts for the Cowboys as a true-freshman, the first three games of the season and two in the middle of the season, before injuries ended both streaks. He was the first true-freshman QB to start a season-opener at OSU since at least 1950, completing 11-of-11 passes for 123 yards in less than a quarter of play in an 84-0 win over Savannah State. Lunt followed with a 436-yard, four-TD performance at Arizona in his first road start and on the season, completed 81-of-131 passes (61.8 percent) for 1,108 yards, six touchdowns and seven interceptions in six games. The Wolverines website has the Detroit native at 6’4” and 216 lbs which is a big quarterback. He is currently a graduate student at Michigan. Gardner is a three-year letterman that has appeared in 37 contests at quarterback and wide receiver, making 21 starts, including 16 at quarterback and has accounted for at least two touchdowns in 14 of his last 17 games .In 2013, he completed 208-of-345 passes for 2,960 yards and 21 touchdowns and carried the ball 165 times for 483 yards and 11 touchdowns. The season begins in a few days so let’s examine some of the top wide receivers in the league. A 6’0” junior, Diggs is a Maryland native and loving every minute of the attention he is receiving. Probably the best WR in the Big Ten and likely the most coveted by the NFL, he had a terrific 2013 season. An honorable mention All-ACC selection by the media and coaches despite suffering a season-ending injury at Wake Forest (10/19) … a member of the team’s leadership council … missed the final six games of the season … began his sophomore campaign with an impressive game against FIU (8/31), recording 98 yards receiving, one touchdown and 70 yards on three kickoff returns … his impressive play carried over against Old Dominion (9/7) by recording a career-best 179 yards receiving and a touchdown … was named ACC Receiver of the Week following the Old Dominion game … had 110 receiving yards and a touchdown against Connecticut (9/14) … caught six balls for 96 yards against Virginia (10/12) … caught eight balls for 67 yards against Wake Forest (10/19). Wynn caught 46 passes for 633 yards (13.8 average) and 11 touchdowns and finished second in Big Ten and tied for 19th nationally with his 11 TDs, which are third on Indiana’s single-season list He also added one rushing and a 58-yard punt return score for 13 total touchdowns, which led team, shared fourth in league and are tied for sixth in school history Wynn posted 1,158 all-purpose yards with 415 on kick returns (18 returns), 98 on punt returns (seven returns) and 12 on rushes (four carries) and averaged 52.8 receiving yards and 96.5 all-purpose yards per game and 23.1 yards per kick return and 14.0 yards per punt return while starting all 12 games. He is a Cleveland, Ohio native. Bell attended high school in Boulder, Colorado before accepting a scholarship to Nebraska to play football. He started 12 games and finished with a team-high 51 receptions for 577 yards and four touchdowns. He caught five or more passes five times, including each of the final three regular-season games. Bell’s 52 catches ranked seventh on the NU single-season reception list, giving him two of nine 50-catch seasons in Husker history. The junior caught 28 passes in 2013 for 478 yards and nine touchdowns. He had 17-yards per reception average. He will begin facing tougher competition in the Big Ten. Ranked sixth in the Big Ten with 4.6 receptions per game and he grabbed a team-best 55 passes. Jones also ranked 12th in the conference with 52.5 receiving yards per game He caught at least one pass in 11 of 12 games. He hails from Michigan. For our analysis of the top running backs, click here. For our article on Rutgers in the Big Ten, click here. Here are the Top Ten Running Backs in the Big Ten in my opinion. They are listed in the order that I believe are the best of the ten first. Kenosha born Gordon has had an outstanding career at Wisconsin. He is the fastest player in Wisconsin history to reach 1,000 career rushing yards (104 attempts) and owns more runs of 20-plus yards (24) than negative yards (19) in his career. Also, he has accumulated 16 career rushing touchdowns have covered an average of 29.8 yards. Gordon’s only lost fumble in career came on lateral play in 2014 Capital One Bowl as he has never lost a fumble across 288 rushing attempts, 3 receptions or 8 kickoff returns (299 total touches) At Wisconsin, he ranks No. 13 in history with 2,328 career rushing yards and owns 10 career 100-yard games, including nine of 140-plus yards. He ranked 10th in the country and second in the Big Ten with 1,609 rushing yards, setting a UW sophomore record and scored 12 rushing TDs. Also, he led the nation and set UW single-season record at 7.8 yards per attempt which is just the sixth player in UW history to rush for more than 1,600 yards in a season and the only player in the country to have three runs of at least 70 yards. Gordon tied for the most runs of at least 60 yards (4) of any FBS player and rushed for at least 140 yards in 8 of Wisconsin’s 13 games in 2013. The 5’9” 195 lbs. senior from Alabama will complete his final season of eligibility with some fantastic numbers to his credit. Last season, Abdullah ran for 1,690 yards and nine touchdowns on 281 carries. Abdullah topped 100 yards in 11 of 13 games, including a career-high 225 yards against Illinois. He had a streak of eight straight games with 100 yards, and topped 85 yards in all 13 games. He averaged 130.0 rushing yards per game to rank second in the Big Ten and seventh nationally. In conference games, he was even better, averaging 137.9 yards per game to again rank second in the conference. Abdullah was also Nebraska’s third-leading receiver with 26 receptions for 232 yards and two touchdowns. His all-around ability placed him first in the conference and 13th nationally in all-purpose yards per game, averaging 153.8 yards per game. He also averaged 6.0 yards per carry and carried the ball more than 20 times nine times in 2013, including each of the final six games. While showing the ability to carry a heavy load, Abdullah also provided a big-play threat in the running game. He had eight runs of 30 yards or more, ranking among the national leaders in that category. The fifth year senior returns for his final season after spending time for the Spartans at several positions in his career. Now going into his second season as running back, Langford has recorded some outstanding numbers from his 2013 season. He started all 14 games at tailback during a breakout season in 2013 in which he led the team in rushing yards (1,422), carries (292), total touchdowns (19), rushing touchdowns (18), scoring (114 points) and all-purpose yards (1,579) . Langford also led Big Ten in total touchdowns (19) and carries (292) .and was ranked among the FBS leaders in rushing yards (16th with 1,422) and rushing (27th with 101.6 ypg.) He ended the season also ranked among the Big Ten leaders in scoring (third with 8.1 ppg. ), rushing yards (fifth with 1,422), rushing (sixth with 101.6 ypg.) and all-purpose yards (eighth with 112.8 ypg.). A Tinley Park, Illinois native, he left the state and found plenty of playing time for the Hoosiers. His 2013 season was tremendous as he rushed for 958 yards on 131 carries (7.3 average) with 12 touchdowns and caught 19 passes for 193 yards, returned six kicks for 124 yards and finished with 1,275 all-purpose yards. He also averaged 106.4 rushing yards and 141.7 all-purpose yards per game and started the first nine games of the season and missed the final three due to an ankle injury. Coleman tied for second in the Big Ten (T-14th nationally) in yards per attempt, third (22nd) in all-purpose yards per game, tied for third in total yards per play (7.3, T-26th), fourth (T-20th) in yards from scrimmage per game (127.9), fifth in rushing yards per game (22nd) and scoring per game (8.0), tied for fifth in rushing TDs and tied for sixth in total scores. Hailing from Killeen Texas, this senior running back has an outstanding 2013 season as he led team in rushing with 1,202 yards (12th all-time in program history and 27th in the nation last season) on 237 carries (10th all-time in program history and 18th in the nation last season) and became the first Gopher to rush for more than 1,000 yards since Amir Pinnix in 2006 (1,272 yards) He tied for team lead in touchdowns with seven (all rushing) and finished season with 1,376 all-purpose yards (1,202 rushing and 174 receiving), which is the most for a Gopher since 2009 (most for a running back since 2006) and is tied for 16th all-time in program history Elliott had six 100-yard rushing games (team was 5-1), which was the most by a Gopher since Laurence Maroney had eight in 2005 He rushed for more than 100 yards in wins against Northwestern, Nebraska, Indiana and Penn State. The decision made by Rutgers to enter the Big Ten conference was likely made due to the money they would accrue as a member. In 2013, each Big Ten school received over $24M dollars to add to their coffers. Also, the Top Tier of the Big Ten Network will be renegotiated in 2017 and has the makings to be a blockbuster deal for each school in the conference. Now college football is upon us and the Scarlet Knights will get their first taste of Big Ten action when they entertain Penn State on September 13th. The crowds will be enormous and the fandom will be at an all-time high as their team takes the field. 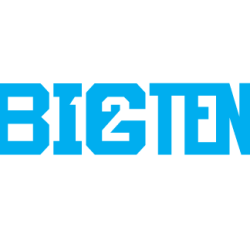 The Big Ten Network will be smiling with all the new television sets in New York and Maryland that have their dial on their programming. Coach Kyle Flood has to be feeling the nerves from going 6-7 last season in the Big East and now getting to see the likes of Ohio State, Michigan State, Penn state, Wisconsin and Michigan. This is big-time football for Rutgers to rub elbows with. One way to prepare for the stiff competition is to hire Ralph Friedgen as your offensive coordinator. The 67-year old came out of retirement to help guide the Scarlet Knights. Friedgen has had several jobs in the Big Ten and understand the scope of the schedule. QB Gary Nova will attempt to hang onto his job as he has sputtered at times in his career. In 28 games, he has thrown 39 interceptions but tossed 51 touchdowns and 6,407 yards. The Big Ten schedule makers didn’t do Rutgers any favors when they welcomed them into the conference. Aside from being in the East Division, the tougher division that includes Ohio State, Penn State, Michigan and Michigan State, Rutgers’ two games against the West Division are against its top two teams, Wisconsin and Nebraska. Welcome to Big Ten football, Rutgers.